Have you ever had a favourite T-shirt? You know, the kind of shirt that you’ve washed and worn so many times it begins to grow threadbare? I have. Mine was a plain old white T-shirt that I wore to work out in. And I loved it. Really loved it. The message on it had me hooked. After some less than successful medical intervention, I finally found some great movement teachers who helped me realize that my problem wasn’t related to any kind of lack of strength or stamina, but it was related to the movement patterns I had established in my body over the years, and the over-working I was doing to try and compensate for dysfunctional movement strategies. I realized that I needed to find a new way to work. Once I learned to respect by body’s needs more fully, I was able to begin pushing limits again – in a way that didn’t cost me so much in physical terms. Sustainable movement. It is possible to work hard, pushing boundaries with intensity if you learn to respect when your body hits a limit. The key is to work with that limitation, instead of against it. There comes a point where too much effort is actually counter-productive. And pain…. 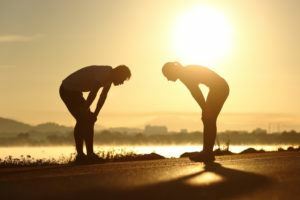 well, pain is not always “weakness leaving the body.” Athletes are pushing boundaries, so sometimes pain is an inevitable part of that process. But sometimes it’s just pain – your body telling you that something isn’t quite right, and that maybe you’d better readjust your tactics if you want to keep doing what you love. Wouldn’t it be great to find a way to move better before dysfunction, pain and injury take an unpleasant toll on the body? Can you imagine developing the kind of sophisticated physical literacy that improves performance, prevents injury and creates EASE in the body – even when pushing limits? The amazing thing is… EVERYONE can do it. It just takes a little time and attention. 1. Listen to Your Body If you pay attention, your body will tell you what’s working and what’s not. Tune in to your sensation, and you’ll find an ongoing real- time commentary about the state of your moving body. You’ll discover transient sensations that flicker in and out, and you’ll notice feelings that pop up again and again. You’ll find sensations that stand up and demand attention, and you’ll feel others that speak more quietly in the background. Remember though, that whenever you learn a new language, it takes time to master it. You may not be used to tuning in to your own movement in such a deep way. But if you continue to turn your mind to the task of finding sensation, and recognizing the relationships between your movement and the feelings you experience, soon you’ll be having an invaluable dialogue with your body that helps to prevent injury and improve performance in ways you never imagined! 2. Observe Effort & Struggle As you train, notice the kind of effort you’re putting out. Are you stressed before you start? Are you fighting with your equipment? Does it feel harder than it should to accomplish simple tasks? Do you fatigue more quickly than you think you should? When you’re training hard, is it harder to get a good night’s sleep? Are you not making the gains in strength and stamina you would like to see? Are the gains you do make inconsistent? Set aside ego for a few minutes and take a hard look. When you are “pushing” your boundaries – can you still find the flow? Feel your edges! Regularly engage with your “soft” edges – those place where you are working, but near the edge of control. Work to expand and increase the range of those soft edges. Learn to recognize the hard edges – when your body moves into survival mode and sympathetic nervous system overload. A good way to know when you’ve gone too far is to notice when your body starts to dis-integrate: when you start to feel uncoordinated and heavy in addition to fatigue. When you find yourself up against a hard edge – explore whether there are ways for you to find some kind of flow there. If not, then you are working in a dangerous zone that leaves you vulnerable to injury. It’s good to get acquainted with this zone – but not to live here. Start to evaluate your return on investment for all that effort. If dysfunction, more frequent injury, and inconsistent results are part of your history, perhaps your approach is not particularly “cost-effective” for your body. Where can you economize on effort to maximize strength & mobility? Are there places that new stabilizing and/or mobilizing strategies might make life easier AND get you better results? Love, and get engaged in, the process – not just the results! Look for ways to balance effort, intensity and drive with mindfulness and sensory awareness in your physical pursuits. Be present in your body, and observe what is going on in the moment. Make choices regarding your training based on what is really there – not what you wish was there. Mental toughness is one thing. Integrate it with physical smarts and your body will love you for life. And there’s an added bonus! You may find that in relating better to your own body, the rest of the world is easier to deal with too. If it speaks to you, take some time to play with this stuff. If you need help, there are qualified professionals who make it their business to get you moving better. The sculpt and burn just doesn’t cut it anymore. You deserve better. And if you have questions, please don’t hesitate to connect. Enjoy – and move well! If you enjoyed this article, please leave a comment below!